Part of why I love my new gig at Cadence Group is that, in my responsibility to be informed and up-to-date on all things public health, I am constantly nerding out on new and exciting topics in my favorite fields. I had the chance to watch a webinar on one of those emerging areas - legal epidemiology - earlier this week. It's basically exactly what it sounds like: "the scientific study of law as a factor in the cause, distribution, and prevention of disease in a population." Despite its potential as a complex and fruitful area of study, there isn't much literature out there on the topic, though CDC's Public Health Law Program appears to be the best place to start). Lucky for me (and anyone else who is curious), the National Environmental Health Association is hosting a three-part webinar series on the topic this summer. The first webinar was held last week, with the recording and slides posted. The second installment is on June 14th, and the third on August 16th. Data visualizations are one of my favorite things, a perfect marriage between my love of data and my experience leading the Communications Committee for APHA's International Health Section. Naturally this meant I got super excited when AIDSVu launched, happened just before I began working as an epidemiologist with the Texas HIV prevention program. 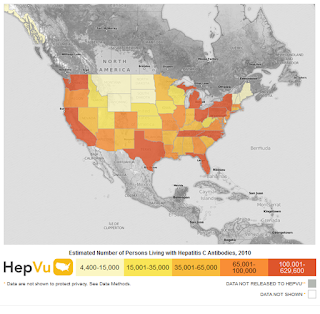 Today I discovered that the initiative has launched a similar site, HepVu, which (as the name implies) makes hepatitis surveillance data available via interactive maps and data visualizations. The Healthy Behavior Data (HBD) Challenge will support the development and implementation of prototypes to use these novel methodologies and data sources (e.g., wearable devices, mobile applications, and/or social media) to enhance traditional healthy behaviors surveillance systems in the areas of nutrition, physical activity, sedentary behaviors, and/or sleep among the adult population aged 18 years and older in the US and US territories. The collection of health data through traditional surveillance modes including telephone and in-person interviewing, however, is becoming increasingly challenging and costly with declines in participation and changes in personal communications. In addition, the self-reported nature of responses particularly in the areas of nutrition, physical activity, sedentary behaviors, and sleep has been a major limitation in these surveillance systems, since self-reported data are subject to under/over reporting and recall bias. Meanwhile, the advent of new technologies and data sources including wearable devices ( such as: smart watches, activity trackers, sleep monitors, etc. ), mobile health applications on smartphones or tablets, and data from social media represents an opportunity to enhance the ability to monitor health-related information and potentially adjust for methodological limitations in traditional self-reported data. The Healthy Behavior Data (HBD) Challenge will be conducted concurrently with a similar challenge proposed by the Public Health Agency of Canada. This will enable the two countries to learn from their respective challenges and leverage information. We expect increased efficiency with a dual challenge. It struck me as pretty reminiscent of the Data for Climate Action challenge by UN Global Pulse. I've unexpectedly found myself in hog heaven since moving to the Maryland side of DC for a new position at the beginning of this month. I'm staying with a friend while I look for my own place and, while I have a much longer commute than I am used to, I am enjoying all 40 minutes of it because I am spending all of them listening to WAMU, the DC-area NPR station out of American University. I've always liked NPR, not only because they provide (I feel) balanced coverage of major news items, but also because they feature so many interesting stories that wouldn't normally get much press, including engaging pieces on public health and human rights. As illegal gold mining is mainly performed in open sky mines that are commonly located inside or close to water surfaces where large pits are dug, it is plausible to conceive that these pits are later filled with water, which would make them ideal breed sites for Anopheles mosquito larva. Because these mines do not follow any protocols or rules and are not registered with local authorities, it is likely that illegal miners have limited knowledge of the need for or methods of malaria prevention. They are likely to leave the pits open and do not take any measures to protect themselves against malaria. Finally, illegal gold miners are also a population that sustains high migration rates, which could also help to propagate the parasite incidence to other areas. Due to data limitations, however, at present, the existing evidence has been concentrated on qualitative studies or on documenting correlations between malaria incidence and gold exploitation. As she points out in her paper, however, there are a number of other factors that could contribute to the correlation without the relationship being causal per se - hence the value of supporting quantitative epidemiological analysis. Rozo is not the first to explore this from an epidemiological perspective, either. This paper by Castellanos et al finds a strong correlation between gold production rates and malaria cases using malaria surveillance data and government data on legal mining activities. One major limitation, though, was that they could examine correlations to legal mining activities - that is, mining operations that are registered with, and regulated by, the government. 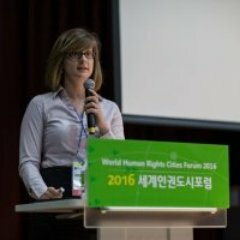 The paper also notes that between the two types of mining (traditional alluvial vs. the more modern "open sky"), the "open sky" technique is less regulated and more likely to be performed illegally. Rozo's analysis is interesting for a couple of reasons. She combines satellite data identifying mining operations with geographic data on geochemical anomalies of gold and matches that to malaria surveillance data to determine the relationship between gold mining activity and malaria incidence. She also controls for several potential confounders, including poverty levels, presence of government and health institutions, climactic factors, and chronic disease. This is the type of analytical application that makes spatial epidemiology so exciting and demonstrates how epidemiology can be used to build or strengthen the case for policy change to benefit public health. It also spotlights why political and economic forces that we don't typically think of as explicitly health related are still very much relevant to public health researchers and policy makers. Less than a month before Rozo's paper was posted, the New York Times ran a story on how malaria has come back with a vengeance in Venezuela since the economic crisis. As many professionals had turned to gold mining to survive, they were repeatedly getting sick with malaria - and taking it back to the cities with them. This week's Data is Plural edition features two health-related datasets that caught my eye: one on grocery shopping from Instacart and one from the National Science Foundation on doctoral degree holders in the science, engineering, and health fields. Three million grocery orders. Groceries-on-demand startup Instacart has released a dataset containing 3 million orders from 200,000 (anonymized) users. “For each user, we provide between 4 and 100 of their orders, with the sequence of products purchased in each order,” the company’s head of data science writes. “We also provide the week and hour of day the order was placed, and a relative measure of time between orders.” Here’s the data dictionary. I always love spotlighting polio eradication. Along with Guinea worm, it is one of the few candidates to follow smallpox to the eternal (or so we all hope) halls of eradicated diseases. While the eradication effort has suffered its setbacks in recent years, public health workers have persisted, steadily marching onward. And frankly, there has been so much hand-wringing in global health in recent weeks that it is important to occasionally remember that there are still wins we can, and should, celebrate. The primary means of detecting poliovirus transmission is surveillance for acute flaccid paralysis (AFP) among children aged [less than] 15 years, combined with collection and testing of stool specimens from persons with AFP for detection of WPV and vaccine-derived polioviruses (VDPVs)...in WHO-accredited laboratories within the Global Polio Laboratory Network. AFP surveillance is supplemented by environmental surveillance for polioviruses in sewage from selected locations. Genomic sequencing of the VP1-coding region of isolated polioviruses enables mapping transmission by time and place, assessment of potential gaps in surveillance, and identification of the emergence of VDPVs. For public health nerds like me, all of MMWR's polio reports can be found here. Basically, a combination of syndromic and environmental surveillance allows public health systems to track polio where it pops up, and genetic sequencing helps to trace how the virus got to where it did to shed light on transmission patterns and find gaps in surveillance. This is all pretty straightforward stuff - we all know generally that surveillance systems do, in fact, work when their infrastructure is properly supported and that children should be vaccinated against polio. But it's important to not lose focus on our successes and global health progress, even when it is simple, straightforward, and sometimes slow.